Baby Bowser Bonkers is a minigame found in Mario Party 3. As a Duel minigame, it is played by two characters. The minigame itself is based on the well-known arcade game Whac-A-Mole. The objective of the game is to score as many points as possible by hitting the popping up Baby Bowsers on the head. The minigame Baby Bowser Bonkers takes place on a yellowish rock surrounded by a vast lake of lava. It is surrounded by a high rectangular fence, resembling a cage. The rock itself has various small and fourteen large round holes in it. The fourteen larger holes are framed by metal rings with four spikes on each side. After the game starts, the players can roam freely over the yellow rock. 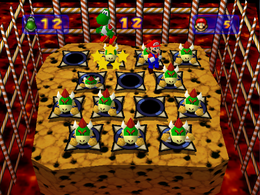 While the game is in play, numerous Baby Bowsers pop up from the fourteen large holes in the ground. The two players have to score points by jumping on their heads. For each hit Baby Bowser, the player obtains one point. When the timing is right, players can also consecutively bounce from one Baby Bowser to the next without touching the ground. Although this method saves the player some time, this does not yield the player any additional points. After 30 seconds, the game ends and the player with the greater number of points wins. Tumble: "Try to stomp on as many Baby Bowsers as possible as they appear in the holes." Goomba: "Lots of Baby Bowsers will pop out of the holes! Score points by stepping on them!" Tumble: "If you step correctly, you'll be able to score consecutive Baby Bowsers." Goomba: "If you time it right, you can stomp lots of Baby Bowsers in a row!" Fumifumi Minikuppa Stomping Baby Bowsers, 「ふみふみ」 fumifumi being onomatopoeic for stomping. This page was last edited on November 9, 2017, at 21:03.